What are the common symptoms of compression fractures? This trauma may not manifest itself with typical sudden or severe back pain. The symptoms are diverse and progressive. Affected patients suffering with compression fractures experience increasing pain when standing, walking, and with increased activity. Relief from the pain can be found through resting or lying down temporarily. Often there is chronic pain when involved in a lot of bending or twisting motions are used. Additionally, height loss occurs with compression fractures with the collapse of each level of vertebrae. This results in a noticeable shorter stature and a deformity of the spine. The deformity known as Kyphosis creates a curve in the spine commonly called a “hunchbacked” condition. There may also be abdominal pain caused by the shorter spine placing pressure on the stomach that can lead to loss of appetite, constipation, and weight loss. Another result of compression fractures and vertebral collapse is difficulty in breathing due to the lungs not functioning properly as a result of spinal compression fractures. How are Compression Fractures Caused? Usually, injuries, as a result of a hard fall cause one or more of the vertebrae to collapse in the instance of patients suffering with osteoporosis or arthritis. Another rare cause of compression fractures has been found to be a tumor located in the spine, although it is not as common. Who is at risk for compression fractures? Individuals such as elderly people and women with osteoporosis especially, are at risk, due to the fact that their bones are less dense. In this case, bones become thinner due to osteoporosis which makes them weak and at risk for compression fractures by being unable to carry normal weight and the pressure of activities in daily routines. How is a Compression Fractured Properly Diagnosed? In addition to a physical exam of affected area to reveal tenderness, tests like imaging studies using spinal x-rays will show shorten and compressed vertebra. The use of an MRI or CT scan are best to ensure an accurate diagnosis. What are the Most Effective Treatment Options? The various treatment options include the use of pain medications, bracing, and the modification of normal activity. 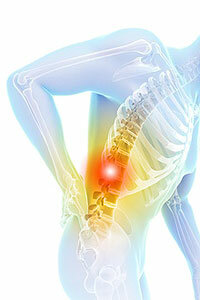 Physical therapy, along with back braces may be used to strengthen and provide support during the healing process. With cases of those suffering from osteoporosis, calcium supplements to strengthen the bone and medications may be used to aid in preventing future fractures. Typically, it will take three months for vertebral fractures to heal completely.